This program analyzes the contents of both existing and deleted browser system files and collects detailed information on a user’s online activity. The utility allows you to analyze browsing history, social media messages, search history, emails, videos watched on YouTube, etc. The user-friendly interface is good not only for parents who would like to monitor their children’s online activity, but also for detectives working on digital evidence. The application will give you certain information even if the browsing history was deleted, the data was removed, or the disk was formatted. If you’ve decided to clear your search history, browsing history, or the history of any other past online activities, you shouldn’t assume it will be gone forever. Browsing history can be read easily, and even restored, if necessary. The application collects the history of opened URLs and displays the opening date, total number of visits, and the time spent viewing a certain webpage. For convenient analysis, all websites are broken into categories, and you can filter or sort them by any category. Communications on social media also leave a track in the operating system. There is a special section to show URLs, the accounts used, the people with whom the user interacted, and the total time spent on communication. Using the saved logins and passwords, you can get direct access to the private information of a person’s account – messaging history, photos and videos. The history of all search queries is given as a separate section. It contains all the information about searches made with popular search engines such as Google or Bing, in online stores like Amazon or Ebay, online maps by Google, social media like Facebook and YouTube, dating websites such asBeNaughty, Match, Tinder or OkCupid, and millions of other web sites and services. All emails – viewed or sent – are available for review in a separate section. In addition to the date, it shows you the name of the resource where the email was viewed, the user account, and the subject. By using the received passwords, you can read someone else’s correspondence. All bookmarks created by the user will be shown after scanning the browser. You will have access to bookmarks created both from a desktop computer or a smartphone. The saved web page URLs contain the date of creation and are arranged as a directory tree. The history of all downloaded objects is given as a separate section. For every download, the complete address and the time of starting and finishing the download are shown, as well as the path to the file on the disk. When visiting any webpage, Chrome, Yandex, Opera and Mozilla Firefox copy numerous images and other objects onto the hard disk – into the browser cache. 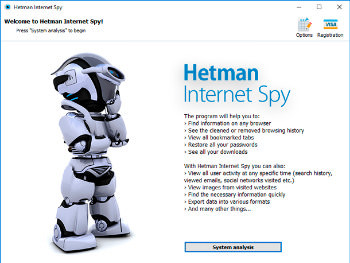 Hetman Internet Spy restores the files and the date of first access from the browser cache and shows it for review. For convenience, modern browsers suggest remembering passwords to user accounts in Facebook, Instagram, Twitter, email services, etc. This utility extracts saved passwords and addresses entered in contact forms from a person’s user account. Using the login keys, you can view someone’s emails and social media messages. Entering a person’s accounts in Google and Facebook gives you access to complete browsing history and search queries, all movements (via Geolocation), all the person’s contacts, and lots of other private information. Deleting browser system files from the hard disk with Shift + Del or formatting the partition with subsequent reinstallation of a Windows operating system gives no protection against the Internet Spy. Hetman Internet Spy scans the disk directly and recovers the deleted browsing history. You will be able to recover browsing history after it is cleaned, reset to default settings, and even after the browser is uninstalled and reinstalled. Using an Incognito tab in Chrome and Yandex, or a Private tab in Opera and Mozilla Firefox does not hide the browsing history, and you’ll be able to view it. You can save all the received data to Excel, HTML or PDF for further use or to import to other systems. The Report Wizard will help you select and export any useful information.